1. When I connect Codey to mBlock 5, a window pops up telling me “Unidentified device”? 2. 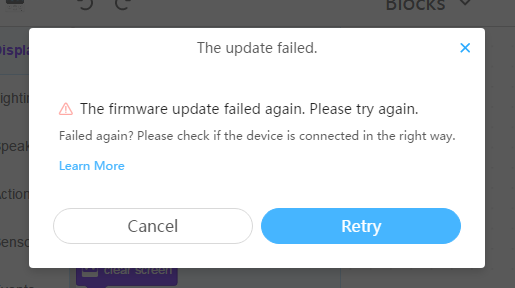 I’ve tried updating the firmware many times but failed. What can I do? 3. How to restore my Codey to factory settings? 4. The system shows “The device driver is not enabled. Solutions”. 5. Can Codey Rocky talk? 6. I prefer to connect Codey Rocky to the computer via the computer’s self-contained Bluetooth? Is that OK? 7. I couldn’t connect Codey Rocky to a phone or an iPad. mBlock 5 keeps telling me to update the firmware. How to fix it? 8. When I connect Codey Rocky to an iPhone or iPad, mBlock 5 shows “Unidentified firmware”. How do I solve the problem? 9. Can I update the firmware of Codey Rocky in the mBlock 5 app? 10. I cannot save projects to desktop and the Virus & Threats Center pops up telling me “Unauthorized changes blocked”. 11. Codey Rocky has connectors at its back. What’s the function? 27. I installed mBlock 5 on my Mac and tried to connect Codey to the software. But I got a "System Extension Blocked" notification and the connection failed. How to solve the problem? • You connect Codey to the wrong serial port. Click Change a new COM and select another port from the list to connect. • The problem might happen when you use a dongle to connect Codey to mBlock 5. If the dongle fails to pair with Codey, mBlock 5 will remind you there is an “Unidentified device”. In this case, you are not supposed to update the firmware right away. You have to pair the dongle with Codey first. • Mistakenly match the device with a wrong sprite. 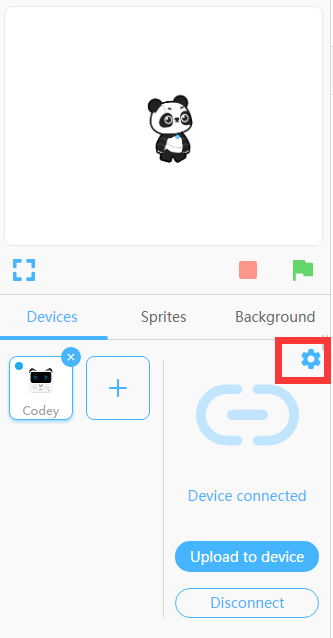 For instance, you are connecting an mBot but the sprite you select in the mBlock 5 is Codey. Or you are connecting a Ranger while the sprite you select is mBot. • The file system of the device has been damaged. You need to recover the file system by clicking “Restore to factory settings”. If your Codey is damaged and you fail to recover it by updating the firmware, you can try restoring Codey to factory settings. Note: After restoring Codey to factory settings (firmware, the operating system and built-in programs will all be restored to the initial status), you might need to update the firmware again. This problem happens mostly when we are installing mBlock 5. When the security software or VPN is enabled, the installation might be interrupted. Close the security software (including the windows firewall) and VPN first and then re-install mBlock 5. If Solution 1 doesn’t work, then try Solution 2. Close the security software and VPN. Then, re-install mBlock 5. Change the installation directory location this time. In some cases, users install mBlock 5 to a non-default installation location. In this case, the system authority management will block the device driver from being enabled. Re-stall the software to the default installation location. Codey Rocky has no speech recognition block so it can’t talk. However, Neuron will come with a speech recognition block and can work with Codey Rocky. Mobile phones always come with a standard Bluetooth version while Bluetooth protocols and standards vary across different computers. Only a small portion of computers have the matching version. To ensure users better experiences, we currently don’t support connecting Codey Rocky via the computer’s self-contained Bluetooth. 1）Download the latest version of mBlock 5 PC. 2）Connect Codey Rocky to mBlock 5 for PC and update the firmware. 3）Try to connect Codey Rocky to your phone or iPad again. Temporary solution: Restart your phone/iPad and Codey Rocky. Try connecting again. We currently do not support updating the firmware on phones, but we will roll out this feature later. You need to reset the computer system. Close Windows Defender or add mBlock. exe to the trusted list of Defender. Codey Rocky has Pogo Pins magnetic connectors at its back, enabling it to be compatible with Neuron. Users are able to use mBlock 5 to control Codey Rocky and Neuron simultaneously. 12. The Bluetooth dongle failed to connect. What’s the problem? 1）Put your Codey close to the Bluetooth dongle and it will automatically pair with Codey. When the dongle stops flashing, it means that the dongle is successfully connected. 2）Press the button on the dongle and put your Codey close to the dongle. When the blue light stops flashing, it means the dongle is successfully connected. Then you can connect the device to the mBlock 5. 13. Why can’t I upload the programs? 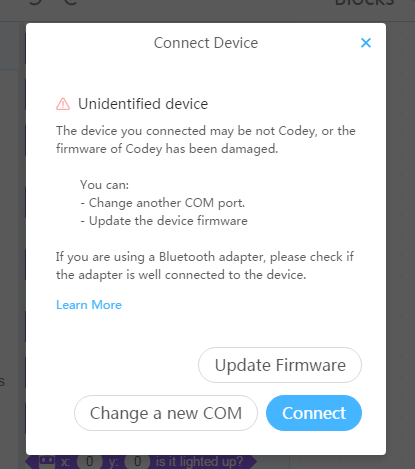 2）If you connect your Codey Rocky via a Bluetooth dongle, first check if the dongle is flashing (light flashing means failed connection). If it is flashing, turn the dongle off and connect again. 3）If you don’t have the problems mentioned above, then connect your Codey Rocky with the software and make sure you select the correct serial port (if there are several ports, try each of them to see if it is the correct one). 14.I get a blank white screen when I start the mBlock 5. What’s the problem? The mBlock uses openGL so a low version of graphics driver might lead to a white screen. To solve the problem. you can use DriverGenius to update your graphics driver. 15. After I installed the software and clicked Connect Your Device, a pop-up window showed that the device was not enabled. Some antivirus programs or security software might block the mBlock 5 to connect to ports. That’s why you couldn’t enable the device. So we suggest that you temporarily disable or exit the antivirus programs when you are running the mBlock. 16. My laptop comes with Bluetooth. Can I connect Codey Rocky to the laptop via Bluetooth? Makeblock provides an official Bluetooth dongle so you can use it for wireless connection. To ensure better experience, Codey Rocky only supports the Bluetooth dongle that’s provided by Makeblock. Therefore, we recommend that you purchase the Makeblock Bluetooth dongle if you expect better wireless connection and faster uploading. By the way, you won’t need a Bluetooth dongle if you run programs on mobile devices (Phone/iPad). 17. Does Codey Rocky support online testing? Do I have to upload offline to run the programs? Currently, you have to click Upload codes to run the programs when you finish writing codes for Codey Rocky. 18. Is Codey Rocky controlled by Scratch? Is face recognition supported? 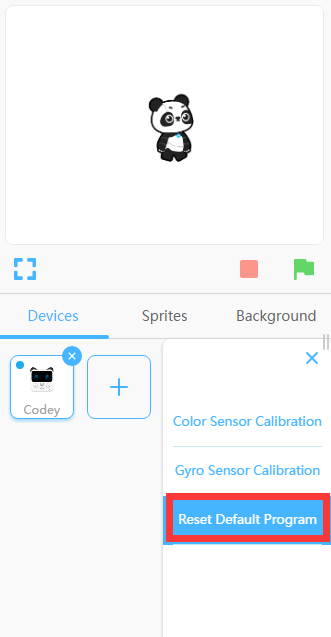 Codey Rocky works with mBlock 5, the companion software developed by Makeblock. Inspired by Scratch 3.0, mBlock 5 not only supports graphical programming but also allows users to program with Python. Moreover, mBlock 5 has AI blocks that support technologies like face recognition and speech recognition. 19. Can I find any app available on mobile devices? Codey Rocky supports mBlock 5 PC. It also supports mBlock 5 for Phone/Pad. Search mBlock 5 in app stores to download. mBlock 5 is available for iOS. 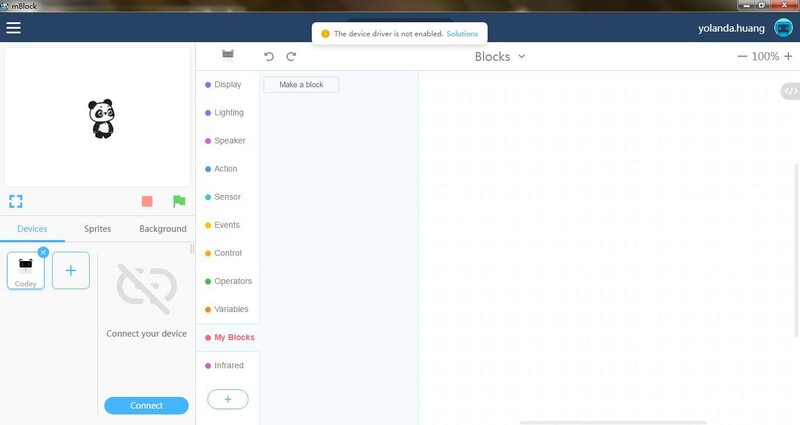 Makeblock app is available for iOS and Android. 20. The IoT feature didn’t work. What’s the problem? You will need the cloud server if you want to use the IoT feature. 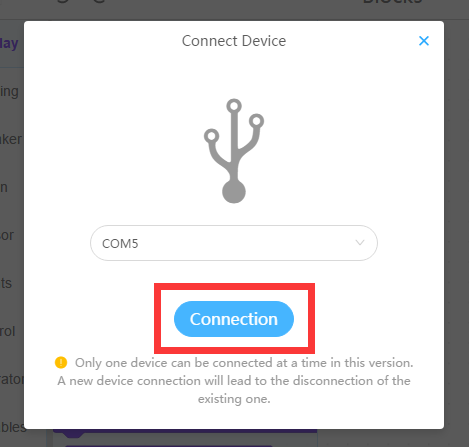 So you have to create an account for mBlock 5 first, sign in and connect to the network. Then, you can use the IoT feature. How to sign up: click on the icon in the top right corner of mBlock 5 to sign up. 21. What should I do to add the IoT blocks? First, select Devices on the tab. 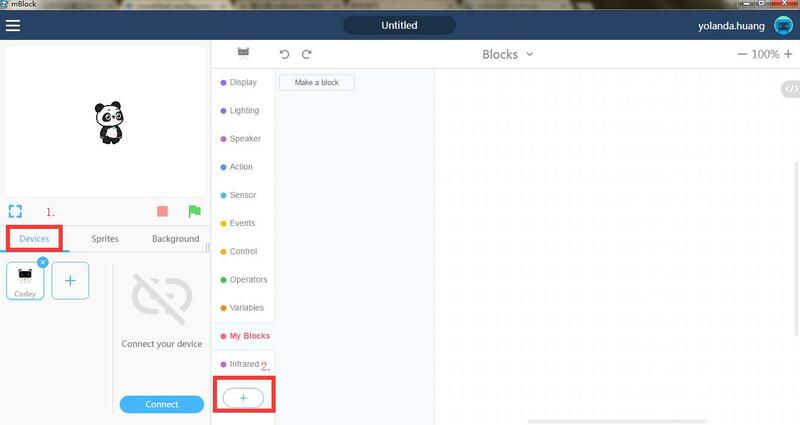 Next, click the plus button + in the Blocks area to add the extension. There, you can find the IoT block. 22. I want details about the IoT feature. Where can I get access to example courses? To help you better understand what Codey Rocky can do, we’ll roll out example programs next. Stay tuned for more! 23. Is my Codey Rocky covered by warranty? How long is the warranty ? Makeblock provides a 6-month warranty for electronic products and a 3-month warranty for motors. Other accessories are not covered by warranty (including structural parts, consumables, batteries, etc.) but we will send you replacements if there is damage to these parts due to manufacturing problems. 24. Where can I get help if I run into issues? 25. Does the sound sensor only detect whether there is a sound? It can detect the volume of sound. 26. The system shows: Your graphics driver version is too low. Please update it and try again. To update the graphics driver, you can get help from other software like DriverGenius or directly download the latest official graphics driver. The same problem might occur if you open the mBlock 5 instantly after you start the computer. It is because that it takes time for the system driver programs to work. Solution: Restart the mBlock 5. Go to System Preferences->Security & Privacy. You will see the "System software from Jiangsu Qinheng Co. Ltd was blocked from loading" notification. Click the button "Allow" and try again. 28. After I connect Codey Rocky to mBlock 5 on Mac, it shows that no serial port is detected. Click Allow and restart the mBlock 5. Connect Codey Rocky to mBlock 5 and serial ports will be detected this time. Note: Only when the lock at the bottom is locked on and the second option is checked off, can the option Allow be available for being selected. So you need to check off the second option（App Store and authorized developers), and make sure the button lock at the bottom is locked on. 29. When I download mBlock in the system of MacOS High Sierra 10.13 or later versions, it shows that no serial driver can be detected and the software can’t connect to Codey, mBot or other hardware. The macOS High Sierra 10.13 or later versions require user approval before loading new third-party kernel extensions. mBlock uses CH340 serial driver so it will fail to connect to Codey or mBot if the extension loading is not approved by users. If you are to download mBlock 3, you still have to stick to the solution to solve the driver problem.